Dubai: Nearly a year after breaking ground, the public is being offered a sneak peek of what it’s like to build the world’s next tallest man-made structure. 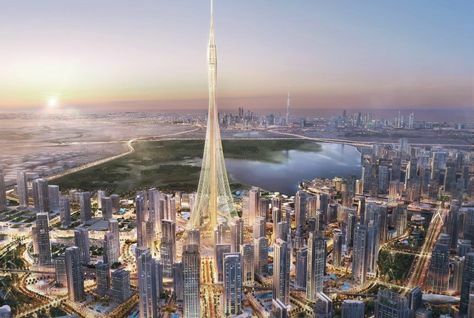 Proponents of the “gravity-defying” Dubai Creek Tower, envisioned to be taller than Burj Khalifa, have shared images showing the progress at the work site in Ras Al Khor, as well as the complex process and heavy machinery required to build an icon. Gigantic construction equipment can be seen on site and so far, workers have spent one million hours on the project without accident. At least 170,000 cubic metres of soil have been dug up, 211,200 tonnes of concrete have been poured and 15,000 tonnes of steel cages have been installed at the site, according to the video released by Dubai Media Office on Saturday. The tower, whose design takes inspiration from the lily flower and traditional minarets, will become the centrepiece of a mega development, the Dubai Creek Harbour that is said to be bigger than Downtown Dubai. Work on the foundations has already been completed. The project broke ground in October 2016.